Taking photos for on line selling is a big problem for many sellers, especially when there isn't a lot of money around to buy fancy light boxes etc. So I thought I'd show you my photographic "studio" set up and a selection of my product shots, and explain how I get there with minimal cost. My biggest sellers on line are small paintings for miniature collections and dolls houses. Folk who are new to mini paintings often don't know how to display them, so for my first product shot I like to show one on an easel on its own - that one usually takes centre stage in my product listings. My easel is made out of matchsticks - the instructions for you to have a go at making your own are here. 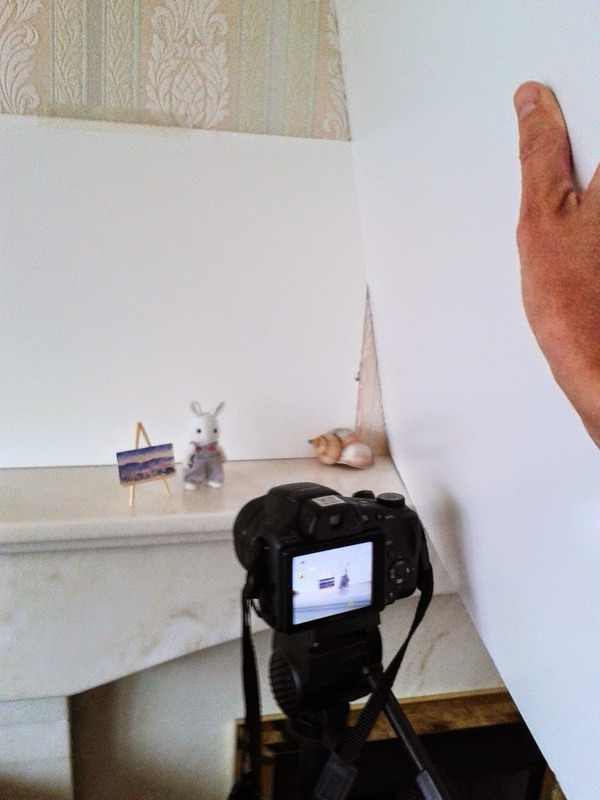 Next I usually take a couple of context shots - here I've used one of our many Sylvanian Families rabbits in one photo and a coin in the other to give an idea of size. Sometimes I include a photo of my fingers holding the painting but the light has to be good enough for a quick snap to work well as I'm not very good at keeping still! They look quite good don't they? So how do I do it without a light box? My photographic "studio" is simply a piece of white watercolour paper to use as the background, a piece of white glossy foam core mountboard (or matt, as some of our friends around the world call it) to use as a reflective sheet to increase the light. and a camera on a firm surface. Depending on the light I use these in different ways. If the natural light is very bad (dark clouds) I set up on a stool by the window like this, with the mountboard as the base and the watercolour paper behind. There's plenty of reflected light in this set up. If the light is brighter but not sunny (white clouds) then I set up on my mantle piece with a tripod like this. I just hold the glossy mountboard so that I can adjust the angle to get the correct amount of reflected light. And if the light is good (sunny day) then I don't use the glossy reflector at all. I like to have my paintings slightly backlit - this helps make the background appear less grey. In both of these set ups the window is on the right hand side and the paintings are turned with their backs ever so slightly to the window. And I always use either a tripod or a flat surface to put the camera on and use a 2 second delay to eliminate camera shake so that I get a nice clear image. This is SO important - if your photo is blurred how can anyone see how beautiful your product is? While we're on the subject of cameras, I use a compact bridge camera that I was lucky enough to win,, however a simple point and shoot camera is just fine. The important thing is to be able to have that 2 second delay in between you pressing the shoot button and it taking the photo. After taking the photos I head over to my pc and I ALWAYS do some editing in Corel Paintshop Pro, taking great care to that my photo looks as good as, but not better than, the painting. I'm very careful to make sure that my customers are not going to be disappointed - I'd far rather they thought "wow this is amazing, so much better than the online photo"! I know my paintings are square or rectangular but sometimes the camera angle turns them into odd shapes - if this has happened then I perform a perspective correction. I adjust the white balance, saturation, lights and darks so that the colours in the photo of the painting appear more like the real thing. This can take 10 to 15 minutes per painting to get right! I crop my photo to a square to give a nice contemporary feel. I'm sure you can do the same sort of editing in Photoshop although I've never got my head around that one. And if you don't have either of those you can download Picassa for free - there's a one click photo processing button that works wonders. You can see how I use all three shots in my product listing here. I really do hope that you found this article interesting and useful for your own product shots. Feel free to share with your online shop buddies, and do please leave me a comment to either let me know how you get on or to share your own top tips too! You're welcome Tessa, I hope you found something new in there. Lovely Stephanie! Some really helpful ideas here. I never even thought about using a shutter delay, to minimise camera shake. 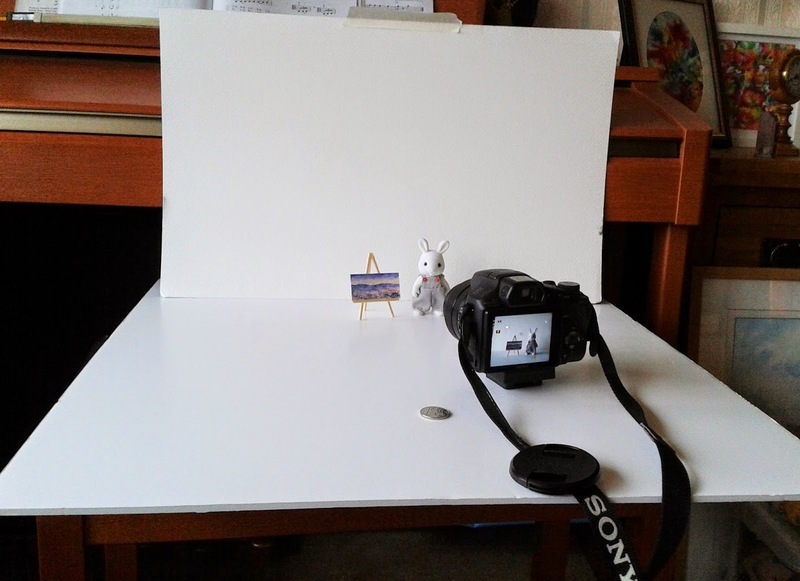 The reflective board is a clever idea too, though I would probably still place my items on a plain, matt white surface, for my "flat shots" and on a wooden surface for the rest - but I use white mount board as a reflector and also never thought about using *reflective* board! Thanks for taking the time to write this - so useful! I'm glad you found it useful Lizzie. Some people recommend using foil covered cardboard, but personally I think that would be a little too reflective and you might get patchy spot lighting happening. Yes these grey days are a problem for photography. I'm glad you found my method helpful. Aw thank you Sally, you've made my day with that comment!